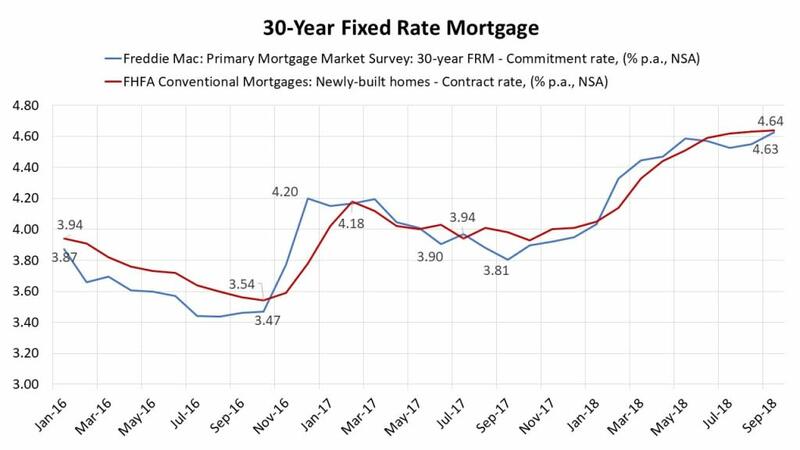 Information compiled by Freddie Mac shows that mortgage rates are continuing to increase after a slight slowdown in the summer months. The 30-year FRM – Commitment rate, inched up by eight basis points to 4.63 percent from 4.55 percent in August. The September increase of the 30-year FRM – Commitment rate, is at its peak level since the beginning of 2017. The Federal Housing Finance Agency reported that the contract rate for newly-built homes, inched up one basis points to 4.64 percent in September. However, mortgage rates on purchases of newly built homes (MIRS) declined by one basis points over the month of September 2018 to 4.62 percent, marking the first decline after ten consecutive monthly increases. After increasing the federal funds rate to 2 percent to 2.25 percent at the September Federal Open Market Committee meeting, the Fed remains on track to continue its gradual approach to raising interest rates.